GERMAN SHEPHERD ZYLAN NEEDS A NEW HOME! 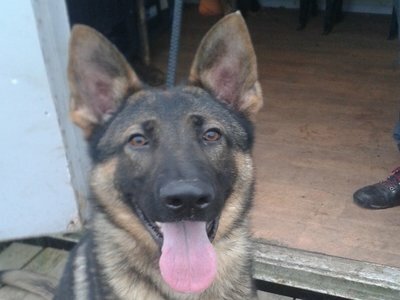 Zylan is a gorgeous German shepherd that has just turned 12 months old. He has a fun-loving and boisterous nature. He’s very ball hungry and has been taught basic obedience. He will sit, stay and walk at heel when asked, and would be absolutely ideal for either a novice handler that would like a dog to train for the security industry or a family that would like him as a pet, as he has yet to be taught any aggression and just a small amount of play bite work. Zylan has a very funny, playful character and while he loves attention, he’s also fond of running off to find a quiet place to chew his ball in peace. Recently, he’s had quite a bit of time in our kennels and for one so young, we would rather he went to a good home to either continue his training or be fussed over as the pet of the house! Please get in touch with our Canine Dept. on 0845 519 8602 if you would like to discuss the possibility of re-homing Zylan.